Magic Carpet Show Horses/Thanks for stopping by! If you are looking for a new sport horse partner or a home for life for your old one, your search has just ended. We specialise in combining the size, conformation, movement and magnificence of proven Warmblood stallions with the elegance and endurance of the Arabian and select Thoroughbred mares. 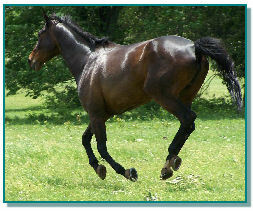 All Arab/Warmblood crosses are registered with both the Arabian Horse Association and American Warmblood Registry. Whenever eligible, we have Breeder’s Sweepstakes Nominated them as well. We highly value the standards of the American Warmblood Registry and have always presented and branded all our American Warmbloods. These horses are sociable, kind and wonderful movers. When it comes to retirees, we bend over backwards. As our broodmares and riding horses have aged, we found we were running a retirement facility anyway, so we decided to take on a few friend’s horses and we’ve never looked back. It is an honour to be entrusted with these wonderful old guys! They have given us so much, and it is such a delight to watch them roll in the grass, snooze in the shade of an old oak, groom each other and just be horses. If you have a very special horse in your barn that is telling you it is time to become a retiree, or a youngster that needs to grow up in a pasture, call us today to find out how we can provide a loving home in a herd environment at a fraction of what you are paying now. We have eight-half acre, grassy paddocks for special needs horses and five large pastures. Our weather is mild and all pastures have multiple, sturdy shelters against the rain or any wind. We have a few stalls, too. Rates start at $335 a month and that’s full care – all their needs including blanketing, trims, worming and most annual shots! We also have multiple horse discounts, so e-mail or call today for references and more information. We do not do any local, public boarding so there is not a lot of traffic or new horses coming and going all the time. This place is quiet, comfortable and healthy. You won’t find better care for this price anywhere, we are positive. We focus on making the horse comfortable with massage, chiropractic, aroma therapy, empathetic concern with all interaction carried out calmly, gently and as if they were our own most loved family members. Spa packages are available for clipping, bathing, massage and mane pulling on schedule. We have a guest room all made up for your visit. Come see why we believe this place is the ideal retirement location. Call today for more information and our impressive list of references: long term clients, vets and farriers. © 2017 Magicarpet Show Horses. All Rights Reserved.